Home staging in Redmond is about more than placing furniture and dusting fan blades; it’s an art and a science. The mission is to influence potential homebuyers to see their future lives in the home while also delivering a functional representation of each space within the home. In this article, IntExt Staging will be sharing how to make your house look livable to potential home buyers. What Makes A House Look Livable? A properly furnished home can make a huge difference between someone loving it or feeling indifferent. Make sure the furniture in your home fits the space it’s in. For example, a smaller living room should have smaller furniture sizes to better utilize the space. 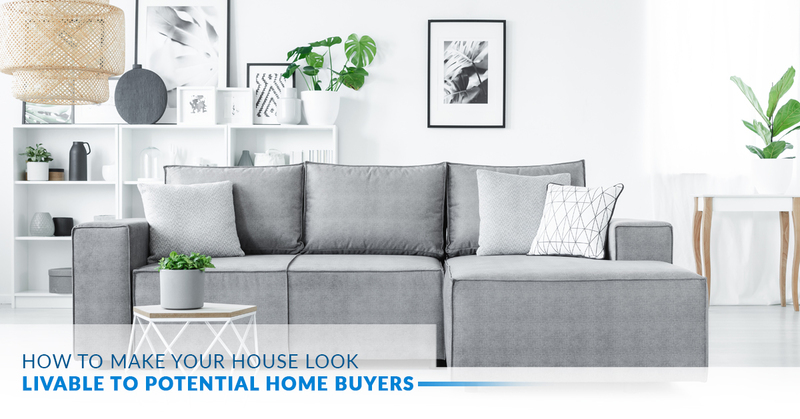 Using large furniture that takes up too much space will make the room feel small, which is a red flag to potential home buyers. Now that you have the properly sized furniture, make sure to arrange it to make the room look larger. Pushing your couch up against the wall actually makes the space look smaller. You want to organize your chairs, couch, and side tables near the center of the room, allowing for space around the furniture to fill the room. The space between the walls and the furniture is what makes the room feel big. One of the quickest ways to make the rooms in your home look and feel larger is to use mirrors. Even one mirror can help due to its reflective properties. The contrast of light on objects is one way humans determine the depth of something. When you add a mirror, it reflects light through the room, showing the eye more than it needs. This results in the perception that a room is larger. No matter the size of the space, how you store items is going to maximize or minimize the space. For example, a smaller kitchen will need to utilize creative storage to keep everything looking clean and tidy. The same concept works for living rooms, bathrooms, and other spaces in your home. The goal is crisp and clean spaces. Roundtables use slightly less space than square tables. Also, they offer a better flow to any room that utilizes one. Finally, a round table also allows, on average, one extra person to sit at the table. If you’re looking to use less space but invite more people to the table, go with round. Yes, lighting can be layered. It’s a simple process that involves multiple types of light in any given space. For example, a living room can have natural light from the windows, overhead lights from the ceiling, and lamp lights on side tables. All of these lights add layers to the space that the human eye uses to determine depth, color, and size. Layer your light correctly, as well as use mirrors, and you can make a room feel much larger and spacious. If you want to really show people that a home is livable, use display cabinets. This allows potential buyers to see how cabinets can be used, as well as showing off the amount of storage in the space. What’s more, a display cabinet grants viewing of the storage without having to actually dig into it, which is convenient for potential buyers roaming around a home. When it comes to selling your home fast and for top dollar, one call does it all. IntExt Staging helps homeowners sell their homes fast. A great way to make a home look livable is to stage it, either with your own furniture or with furniture from your expert home stager. If you want to get top dollar for your home, schedule your home staging consultation today!